NEW!! THE DREAM BOOK IS HERE. Why PAY $200,000.00 to buy a complete WACKY PACKAGES collection, when you can cheat death and taxes and get it all in this 130 page, absolute Wacky detail, large 8.5" X 11" glossy paper with over 1150 COLOR images of all known Wacky Packages! If you can answer the above question honestly, then you are definitely in the wrong place. I'm talkin about every funny, naughty, gross, recalled and deleted card you ever heard of when you couldn't complete your series. Not just hours of fun, this is weeks and months. This final edition, extensively covers the history of Wackys(as told by Jay Lynch in his "Satire" article, and through conversations with Spiegelman and Len Brown). Everything Wacky under the sun including price guide, OPC, sheets, proof sheets, rare cards, boxes, charms, pins, shirts, plaques, cereal boxes, artwork, puzzles, Hostess pairs, tatooes, pogs, unpublished original art, etc., etc. 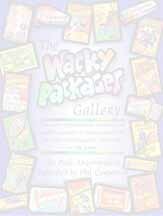 The only thing missing was the Lost Wackys, cause the authors are putz! Never to be republished, be sure to get a copy before the print runs out...maybe even get a backup, if you ever get rid of, lose or misplace it(just like what happened to your original WACKY PACKAGES...arrgggh). This book blows away everything and is the definitive resource for Wacky Packages. Forever. "I'D DIE AGAIN, TO GET THIS BOOK!" One of many exclusive COLOR images shown in book.